Would you consider yourself a freegan? If you pick up items that are being thrown out with the trash, then you are a freegan. If you eat the free samples at Costco and consider that a meal, then you are a freegan. The urban dictionary defines a freegan as: Somebody who abstains from contributing to the economy and salvages society's wasted food and resources rather than purchase more themselves. I had a bad opinion of freegans when I first heard about them, I saw them as being thiscloseto homeless and living a life that my brother used to live. Living in abandoned homes, stairwells and crashing at friend's places. Eating gross looking food that was left-over in the fridge or garbage and spending as little money as possible - which came across to me as being a leech or at the very least, cheap. Over time that idea has changed and I realize that I do some things that are freegan-like. Like when I pulled the dresser from the dumpster so I wouldn't have to buy a new one. But it doesn't stop at just products, freegans also pick up good looking food that they view as good food that shouldn't go to waste. @freegan, who posts their finds on twitter, and gives what they do find to the local shelter, laments that "Only 10% or so of stores have outside bins to glean fresh fruits and vegetables from--the rest destroy w/inside compactor." 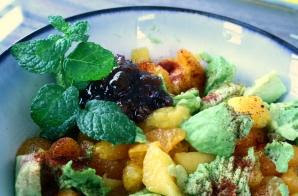 Other freegans who glean from the discards of grocery stores and restaurants do make some delicious looking food -Avocado Mango Mint Salad with Plum Chutney is one meal that Waste Not, Want Green has pulled together from the dumpster. These people have jobs, homes and families. They are the scavengers of the American culture, taking the discarded and forgotten and making it their own, getting that last bit of nourishment or life from it when we have decided none could be found. I am in total support of this and I think it is great that people are able to “live” off of our throwaways with their creativity. Have I ever dived for food? No. Have I ever eaten food that was dived? Yes. My grandfather was a diver after he retired and one of his stops was a bakery near his home, since he had a sweet tooth. He even grabbed some extras for us grand-kids. Mom was hesitant at first and always checked the expiration dates, but we determined if we would eat it, based on whether is was stale or not. 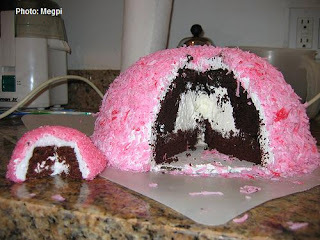 I have to say that my aversion to coconut covered marshmallows are due to this history, they never looked good to me. "they choose to buy and work as little as possible"
Ah. Work as little as possible. That sort of sets the agenda, doesn't it? In the previous iteration of your blog, you quoted an article from a guy who decided to work below the poverty line because he decided that paying taxes was a form of subsidizing the war in Iraq, and he accused regular taxpayers of being willing collaborators in the murder of innocent people. Re-use that which is otherwise wasted? I'm all for it. Refuse to contribute to our schools, social programs and medical research because paying taxes is tantamount to murder? Can't agree with it. I would agree with you, those that CHOOSE to live below the poverty line and not pay taxes, yet use public service, also increase my ire. However, I am hopeful that those who choose to do that are few and far between. so what are you if you give donate to goodwill? what about shopping at flea markets? In Germany, we had junk day. It is bulk trash night, but it was posted on the trash calendar for everyone to remember. This was the night that all the neighbors went for a walk to see if anyone had good junk/treasures. So what are you? I would say you are kind, thoughtful and giving to donate your stuff to others and not trash it. Some cities here in the U.S have very well promoted junk days as well, others not so much and still others don't have one at all. That is great that Germany was behind the recycle/re-using idea! I am a quasi-freegan... 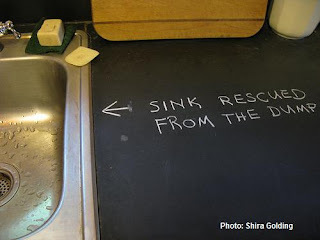 I won't do the food thing, but frugality leads my wife and I to decorate much of our home with other people's throwaways. For example, my wife learned to do golf leafing, and took a solid frame out of the garbage... she refurbished and gold leafed it, and created a piece that was admired in our home for the better part of a decade! Often you can choose to cash out the retirement annuity to decorate, or you can get creative. We choose the latter. my Grandma was a sorta-freegan too, found great comic books (which we loved!) & pieces of cloth etc near the local waste container!! I've never eaten food from a dumpster (does food others had wanted to throw away count? ;) we kids have found some nifty items in the local waste container too! My mom used to (probably still does) ask my dad about old left-overs in frig - should she toss it or does he want it in his lunch. He usually took it. My Dad, the human garbage. LOL! That is cool that your Grams was a bit of a freegan as well - a good lead to follow. Nice blog, This is my first time visiting here,it's nice to meet you.